It turns out we picked over 400 kg of olives. We kept about 50 kg of the biggest and best for eating, and those are in the process of being repeatedly washed and salted and weighted down. 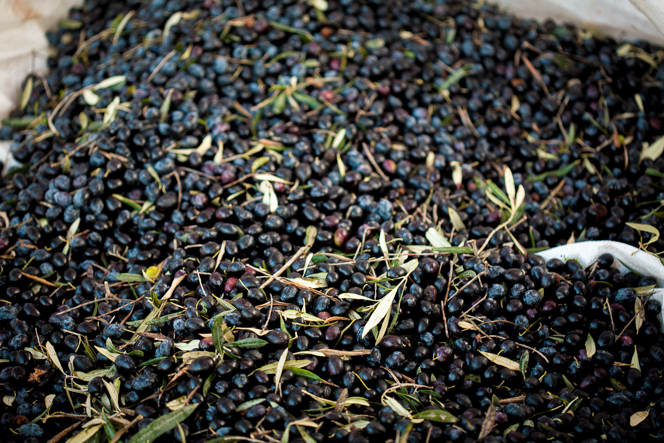 There were seven sacks (323 kg) of normal-quality olives to be pressed into oil. And finally a small sack (38 kg) of poor-quality olives that we took from the ground beneath the trees. 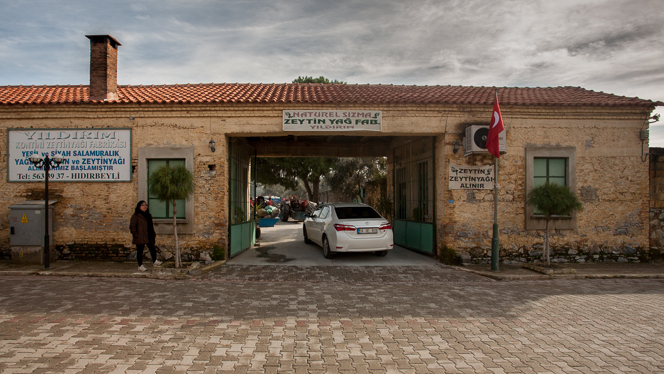 We took our eight sacks just around the corner to the Yıldırım olive processing factory. We sold the one bag of lower-quality olives to the factory, and the money we got for that was enough to pay for processing all the rest. This seemed like a good deal. 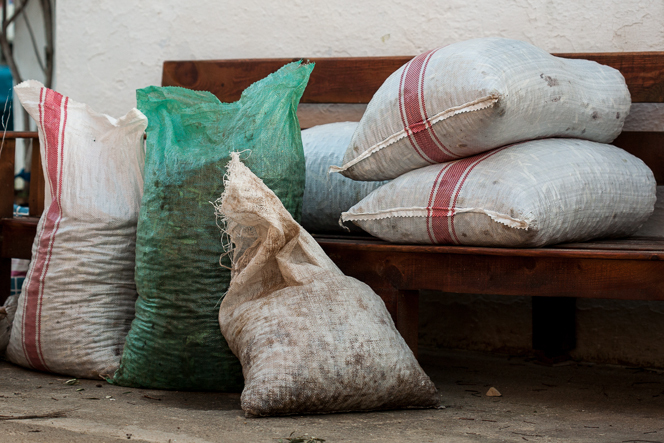 Sacks of olives in the factory yard, waiting their turn to be pressed. 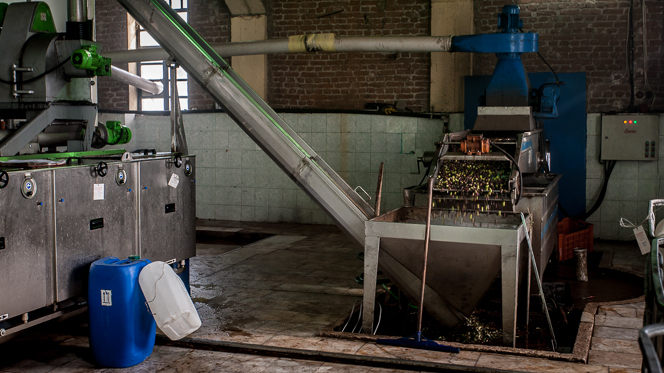 The olives are washed and any remaining leaves are filtered out before pressing. Machines for crushing the olives and filtering the oil. 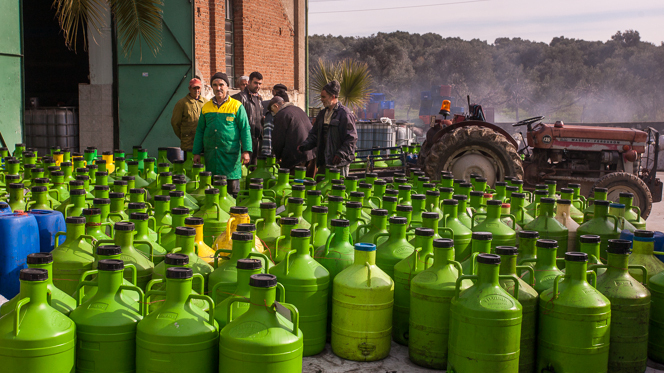 The guys at the factory are incredibly busy right now, as everyone brings in their olives around the same time. So we had to come back the next day to see the results. 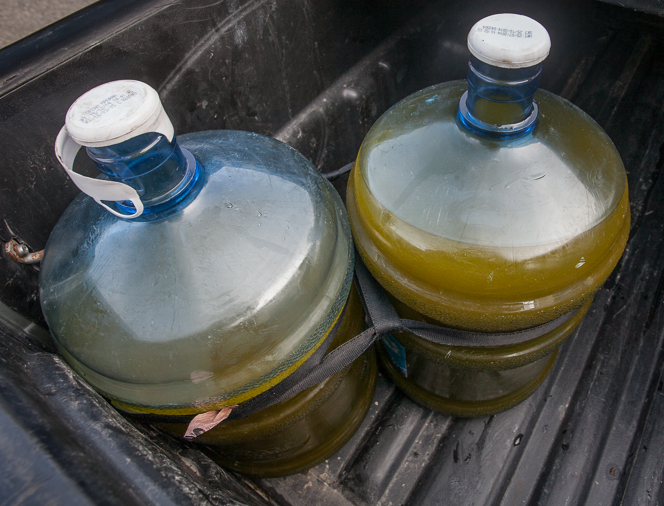 Our 323 kg turned into 67 litres of beautiful cloudy green oil. We’re told it has good, low acidity levels. I would try to describe the taste but I don’t have the adjectives. I can tell you that it is very, very good for dipping fresh bread into. Winter is really here now, and with it has come the rain. Christmas has come and gone. We hope you are all having a relaxing break, wherever you are. We plan to give ourselves the next few days off, but right up until Christmas Eve we’ve been busy with the olive harvest, and also painting and tiling one more bedroom in time for a visit from Sirem’s dad. Winter sunset looking towards Mount Mycale. Every month I learn something new about Mediterranean agriculture. Previously, I had no idea olives were harvested so late in the year. Apparently it’s all about leaving them on the tree for long enough to produce a lot of oil, but not leaving them so long that they start to fall off. From early December onwards, all the hillsides around the village are dotted with the white nylon sheets used to catch the olives when the trees are beaten with sticks. We have about 15 trees, which is not many by local standards. But being non-experts, we decided to get some professional help in anyway. Thanks to Mustafa and Leyla we got our olives down from the trees in a single (long, tiring, back-breaking) day. And then another day to sort them and get them all into sacks. Sirem choosing the biggest and best olives for eating: the rest become olive oil. 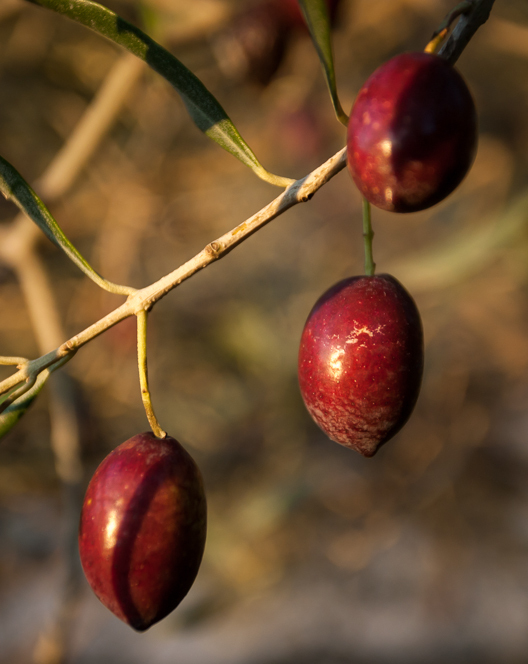 I couldn’t believe that only 15 trees produced about 350 kg of olives. We can’t possibly eat that many, so most of them are going to be pressed into olive oil at one of the local processing plants. 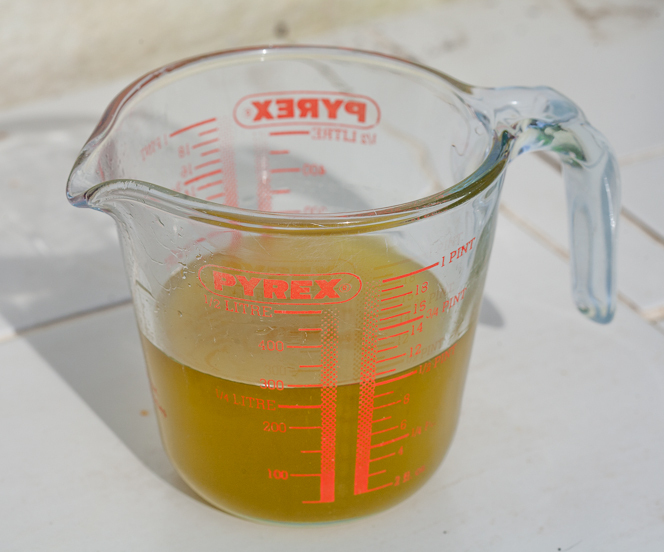 It takes about 5 kg of olives to make one litre of oil, which means we should be set up for olive oil for the foreseeable future. 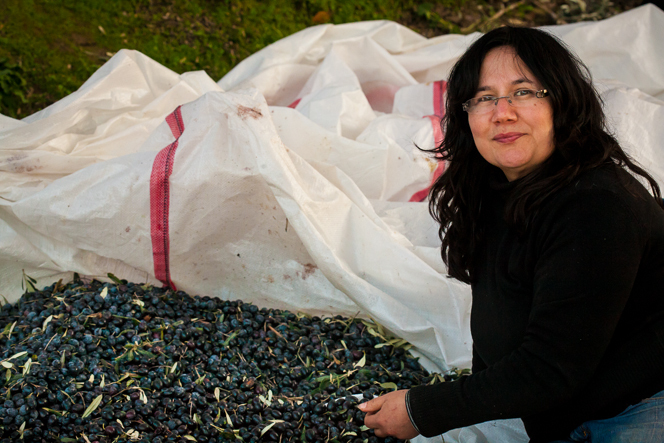 Most of our olive harvest (a few more sacks added later). The biggest and juiciest olives are put aside for eating, but you have to pick them out manually and that takes some time. Right now our best olives have been washed and salted and are sitting in sacks under the weight of some bricks: it will take a month or more before they’re ready to eat. We know they’re going to taste good though, because we’ve already tried some early-harvest olives we picked a few weeks back. 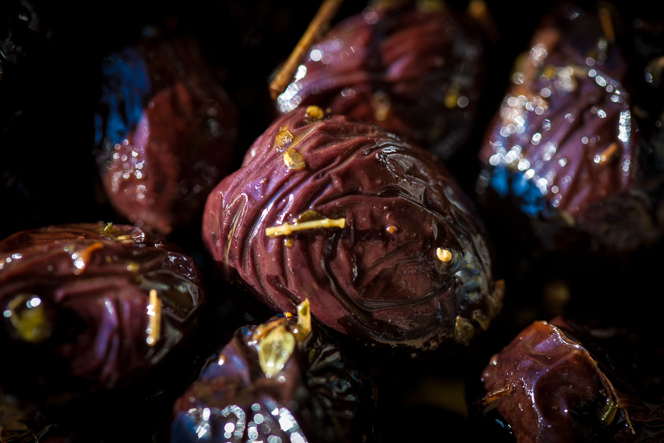 Here’s some we made earlier: pressed, salted olives in oil and oregano. We also made time for a trip to the nursery. We love our orchard, but we don’t want to grow only figs and olives up there. 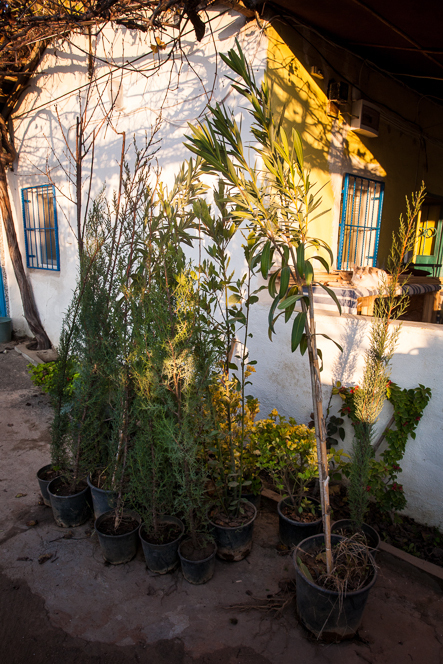 We bought all sorts of things: a cherry tree, some oleander bushes and trees, different kinds of cypresses, a bay tree, rosemary, lavender, and more. Currently they’re all sitting in pots in the courtyard, but we need to get them into the ground and start the long job of landscaping what we hope will be a wonderful garden some day. A selection of trees and shrubs. I’m in two minds about mentioning our progress on the kitchen, because I’m a bit embarrassed about how long it’s all taking. But things are progressing and we will get there eventually. 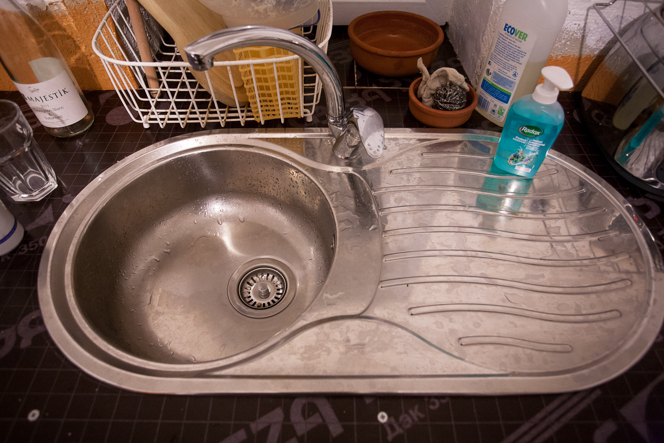 We’re very proud of having made our own drawers, and people who’ve visited us already will know how much of a big deal it was to finally have a sink in the kitchen. Christmas Eve was exhausting, because we had to grout the new tiles in the oldest bedroom before Sirem’s dad arrived on the 25th. This came after a day of olive harvesting, of course. It was worth it, because now we have another warm and welcoming bedroom — but we don’t want to do it again in a hurry. 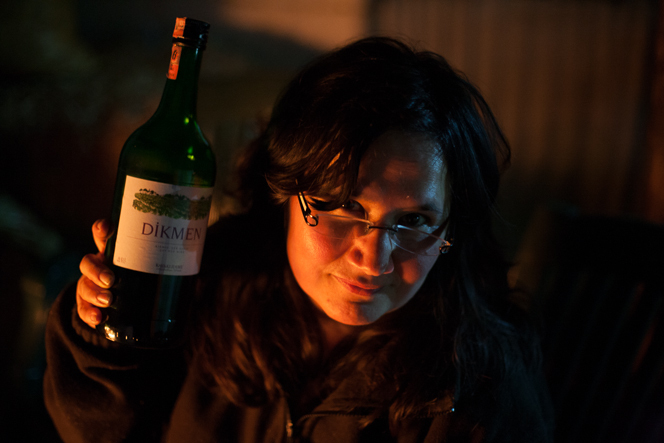 It was nice to relax by the fire on Christmas Day, watching our dinner cook in the coals, and enjoying a few glasses of distinctively named Turkish wine. 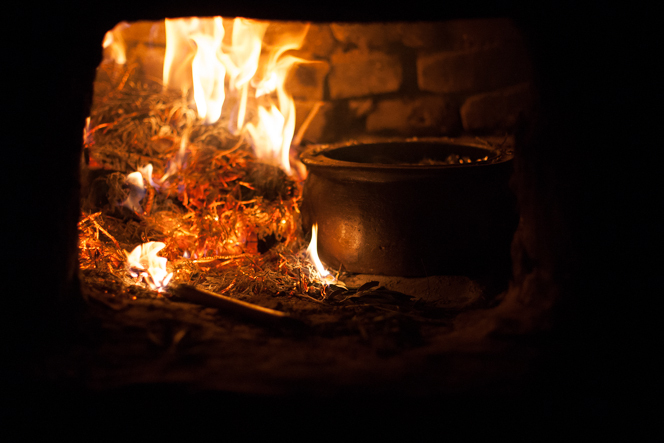 Christmas dinner cooking in a clay oven. This will just be a quick post. I wish there was more to add: we’re pushing on with the kitchen, but the date of the previous post is evidence that progress hasn’t been all that dramatic. On the positive side, we’re learning lots of woodwork tricks that should make us faster in the future. 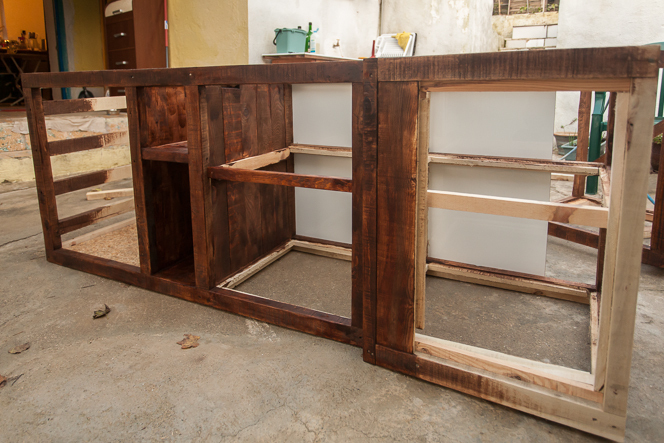 Here’s a shot of one of the kitchen cabinets, almost done. 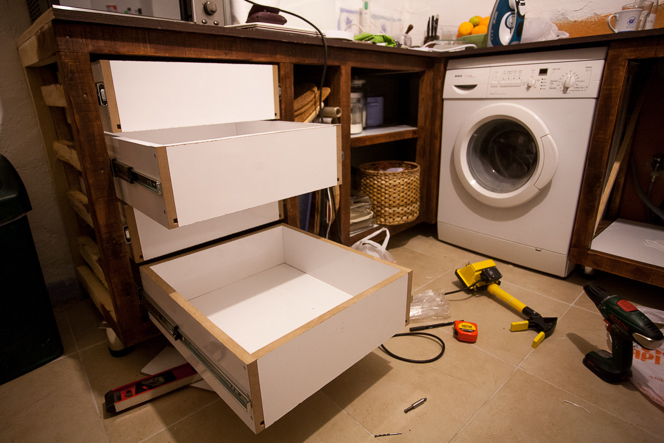 From left to right that’s going to be four drawers, an open slot for storing wine (above) and trays (below), and a large corner cupboard that will sit up against the washing machine. As you can see, we’re going for the rustic look. 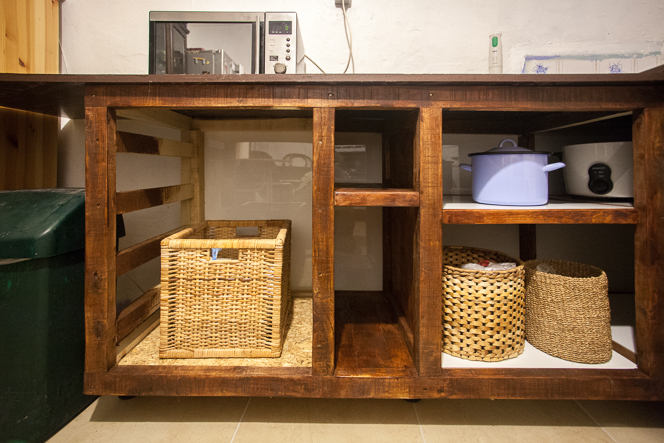 Cabinet for the left side of the kitchen. We’ve picked out the tiles we’re going to use for the worktops. Very Turkish! There will be some interesting cutting to get those hexagons to work, but we think it will be worth it. 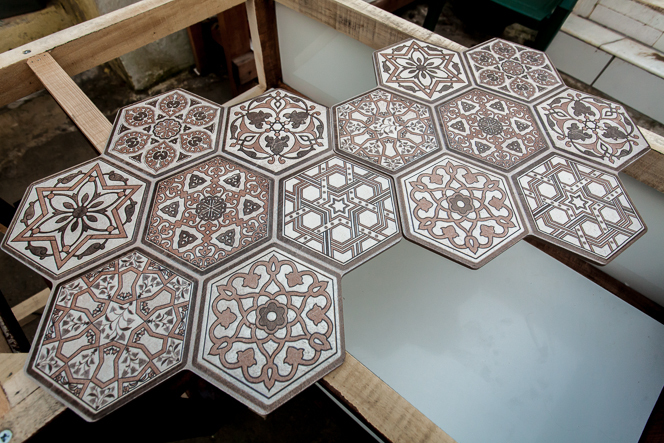 Tiles for the kitchen worktops. 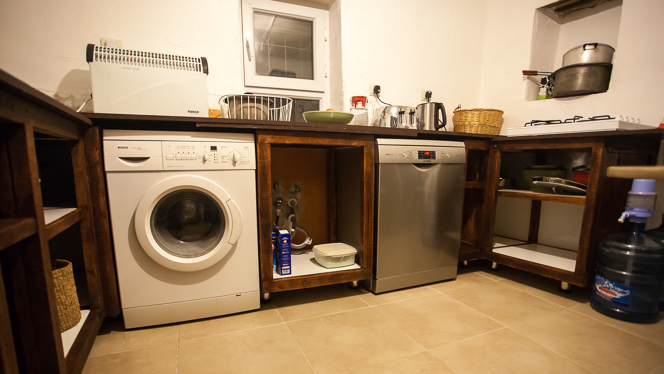 As of yesterday the cabinets actually got dragged into the kitchen itself, which was a bit of a milestone for us. No doors on the cupboards yet, and the worktops still need to be trimmed and screwed into place, but you can start to see what it’s going to look like. Real drawers will work better than a wicker basket. 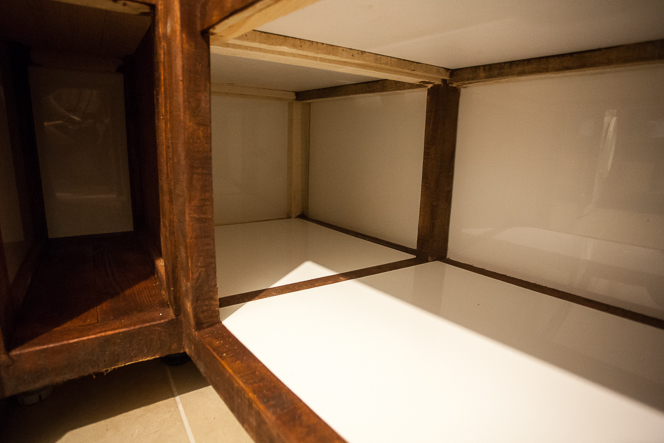 Lots of room in those corner cupboards. A couple of weeks ago I finally found the bag that had my camera gear in it, so I now have a tripod again which means night-time photos are possible. 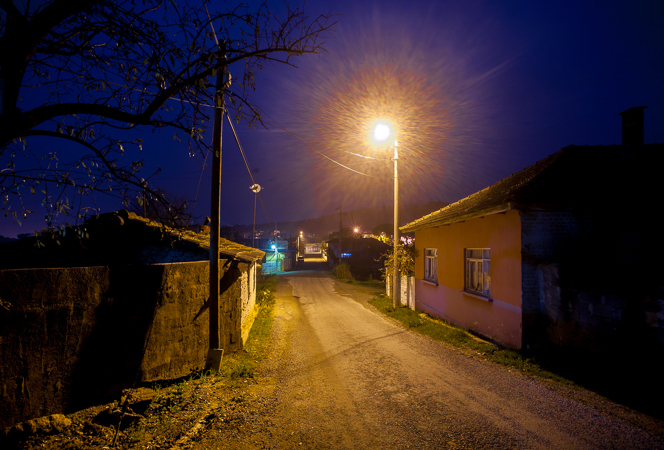 I know I should get out and capture the atmosphere of some of the local towns after dark, but for starters here are a few shots of home. 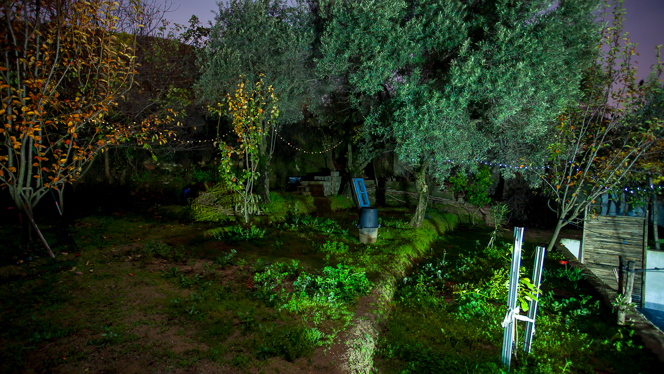 View of our garden by night: the winter rains have made everything green. Looking back into the village from outside our gate.